SKU: CDM. 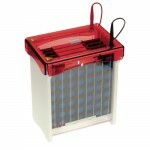 Category: Clinical Gel Systems. Although CellasGEL cellulose acetate gels have a number of advantages over traditional dry cellulose acetate membranes, many manual systems and modern robotic platforms still use dry cellulose acetate membranes, which are usually supported on a plastic backing. Consequently, CellasMEM, a range of dry cellulose acetate membranes supported on a Mylar film has been developed to address this demand. Each CellasMEM dry cellulose acetate membrane is available in 25x76mm (MEM257650), 60x76mm (MEM607625) and 94x76mm (MEM947625) plate sizes, and is compatible with the manual and automated platforms of many leading and emerging brands within the clinical electrophoresis market, including: Helena Laboratories, Interlab and Seleo. CellasMEM is supplied either as individual packs of 25 or 50 strips to perform manual assays for Serum Protein (Dysproteinaemia; Incipient Gammopathies) and Haemoglobin Analyses (Haemoglobinopathies such as Thalassaemias and Sickle Cell Disorders). 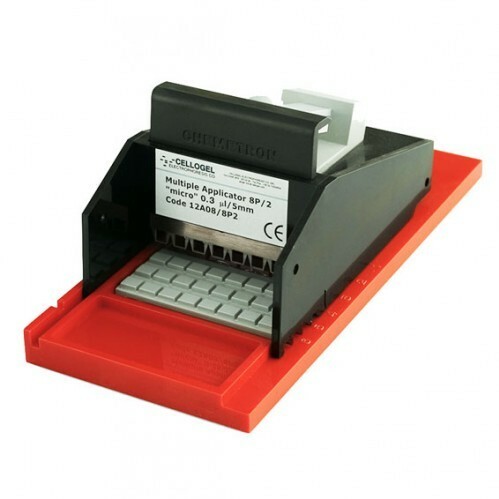 The CellasMEM MEMAPPM8 is an 8-sample micro applicator designed for use with 60x76mm (MEM607625) and 25x76mm (MEM257650) CellasMEM dry plates. The applicator dispenses each sample deposit as a thin band 5mm wide that is equivalent to 0.25μl in volume; and may load either one 60x76mm strip or two 25x76mm strips (4 samples per strip) at a time. By loading each sample as a tighter, but finer, band over a wider front, the sample diffusion and saturation typical of standard syringe loading methods is significantly reduced, resulting in improved band quantitation. A MEMAPPS6 semi-micro applicator is also available to load 6 samples, each sample deposit 7mm wide and corresponding to 0.5μl in volume. Adjustable bridges within the CELLAS tank render specialist bridges unnecessary. Both CELLAS bridges may be positioned either side of the central buffer partition within the tank to produce the 76mm gap necessary to support Helena-type membranes, while the 24cm width of the tank accommodates either three 60x76mm or six 25x76mm CellasMEM membranes per run. 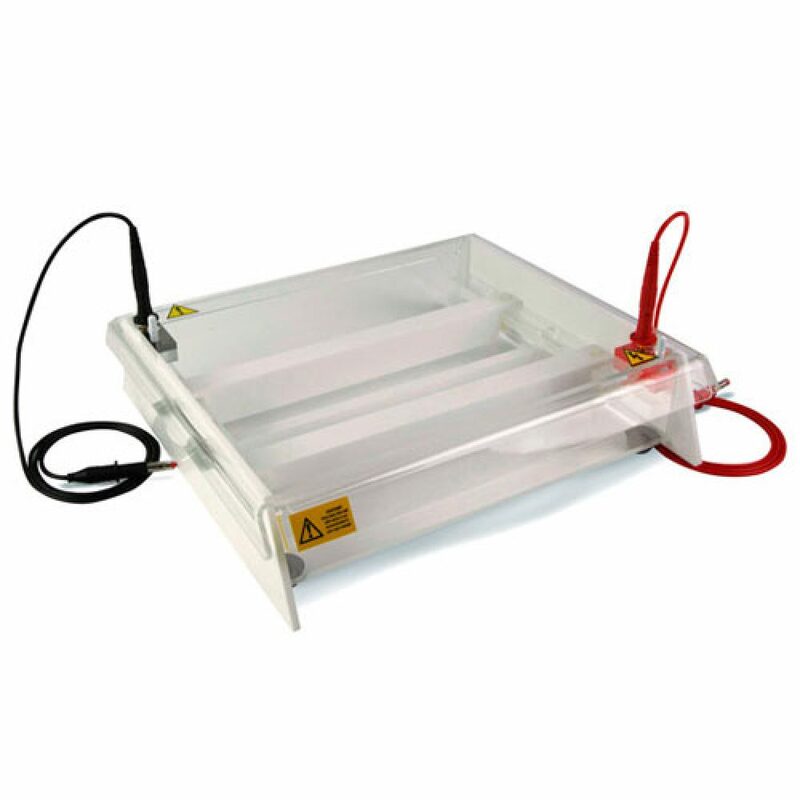 A dedicated bridge adaptor (MEMBA) is available for those users of different cellulose acetate electrophoresis tanks that do not have adjustable bridges. Supplied in packs of 100 and available in 190x60mm and 220x40mm (WxL) sizes, CellasMEM disposable paper wicks may be used respectively with standard Cellas MEM dry plates and CellasMEM dry plates for Helena applications. To set up the Cellas tank for use with dry plates, simply insert each paper wick lengthwise within the tank pre-filled with buffer, so that the buffer will become absorbed. Once absorbed, fold over the top of each wick to make a support bridge, ensuring the bottom edge of the wick is immersed within buffer and in contact with the bottom of the tank, while the top edge rests along the adjustable bridge. Repeat for the other bridge. CellasMEM membrane plates are available in many different sizes and quantities ranging from the market-leading Helena Titan 3 manual system to punched dry membrane plates compatible with the strip-holders of automated systems from Genio Interlab and SELEO. Also listed are CellasMEM membranes for older systems (some of which are obsolete) that are still in use today. Package deals provide a quick and convenient solution for those users wishing to perform the more popular Helena-type applications. The most basic kit includes 25×76 and 60x76mm CellasMEM membranes, 8-sample micro applicator, and paper wicks, while the complete version also contains a Cellas tank and new NANO500 power supply.